Historically, the Antonov Design Bureau was responsible for the design and development of large military and civil transport aircraft for the former Soviet Union. With headquarters and production facilities in and around Kiev, this Ukrainian aircraft manufacturing and servicing firm is now known as Antonov State Company. The largest of the jet powered transport aircraft built by Antonov are the four-engine An-124 and the even larger six-engine An-225. The An-124 made its first flight in December 1982 and entered operational service in 1986. This aircraft is a counterpart to the Lockheed C-5A, which is the largest U.S. military transport aircraft. 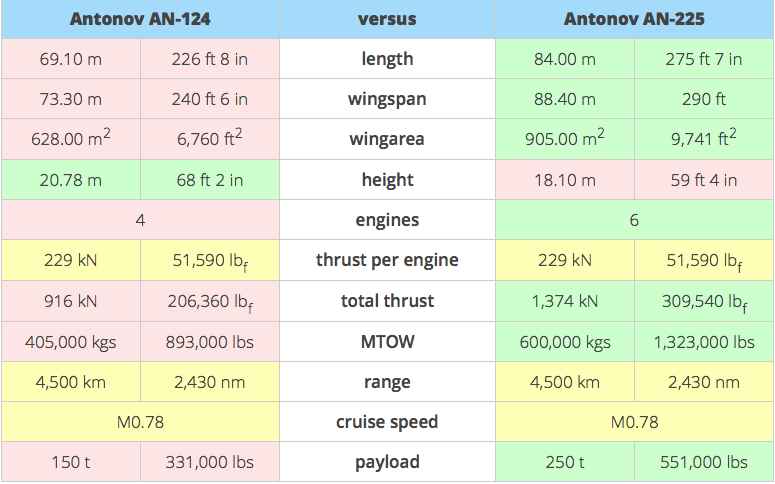 A comparison of the basic parameters of these two aircraft is presented in the following table. 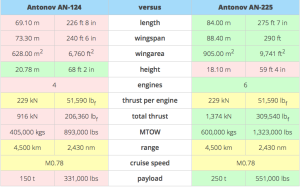 As you can see in this comparison, the An-124 is somewhat larger than the C-5A, which has a longer range, but at a slower maximum speed. 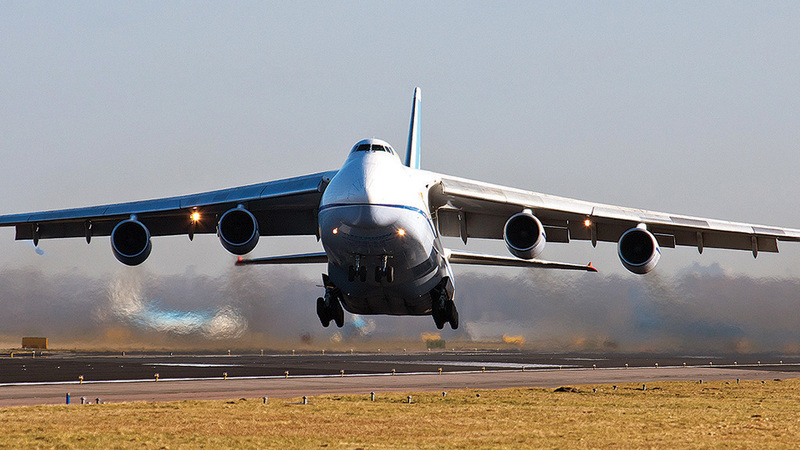 The An-124 currently is operated by the Russian air force and also by two commercial cargo carriers: Ukraine’s Antonov Airlines and Russia’s Volga-Dnepr Airlines. 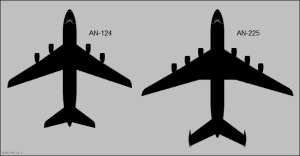 The civil An-124-100 is a commercial derivative of the military An-124. 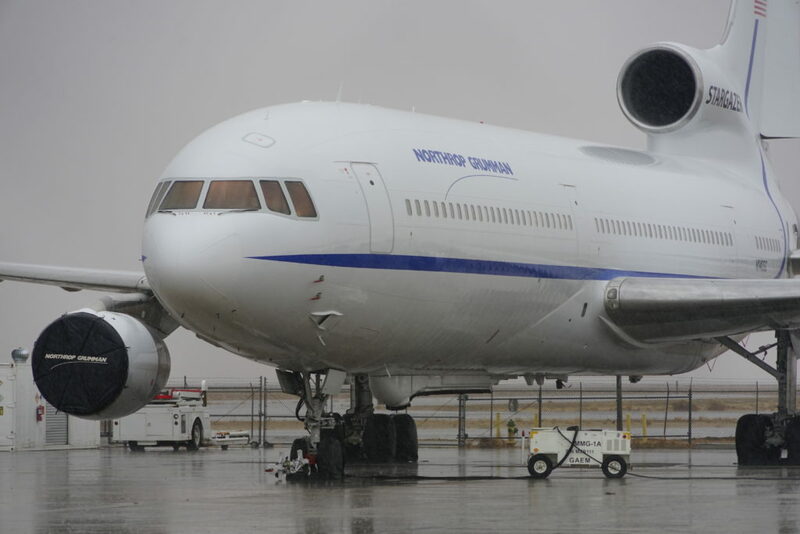 The civil version was certified in 1992, and meets all current civil standards for noise limits and avionic systems. 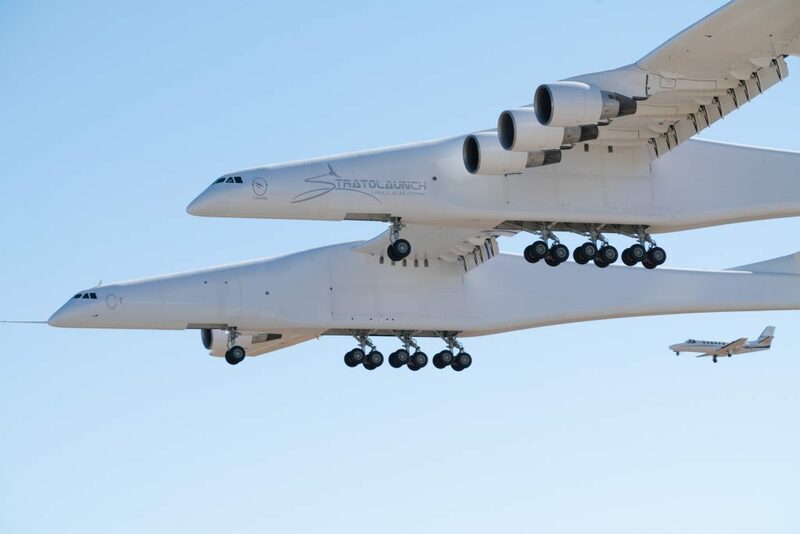 In their commercial cargo role, these aircraft specialize in carrying outsized and/or very heavy cargo that cannot be carried by other aircraft. 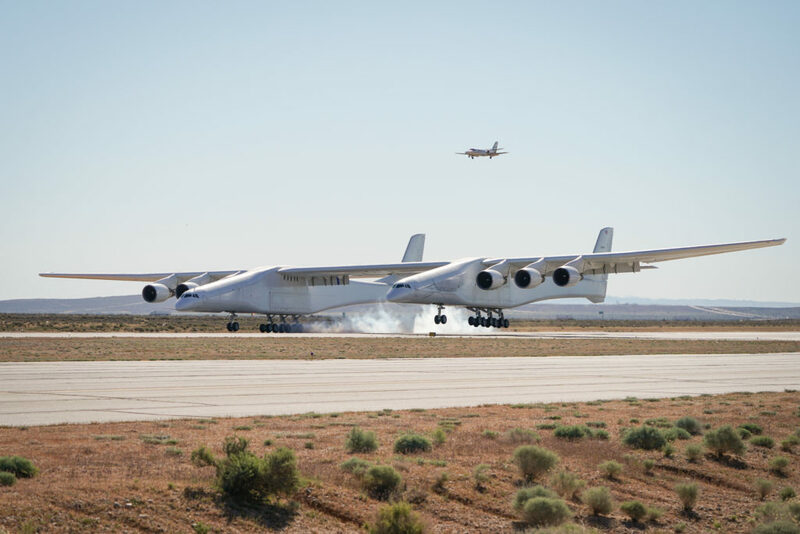 These heavy-lift aircraft serve civil and military customers worldwide, including NATO and the U.S. military. I’ve seen an An-124s twice on the tarmac at North Island Naval Station in San Diego. In both cases, it arrived in the afternoon and was gone before sunrise the next day. Loading and/or unloading occurred after dark. 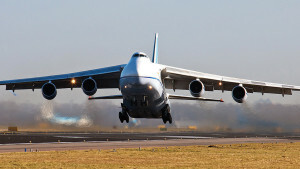 As shown in the following photo, the An-124 can retract its nose landing gear and “kneel” to facilitate cargo loading through the raised forward door. 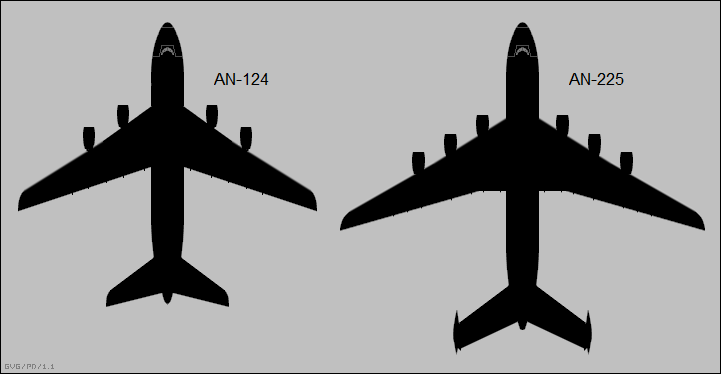 The following diagram shows the geometry and large size of the cargo hold on the An-124. The built-in cargo handling equipment includes an overhead crane system capable of lifting and moving loads up to 30 metric tons (about 66,100 pounds) within the cargo hold. As shown in the diagram below, the cargo hold is about 36.5 meters (119.7 feet) long, 6.4 meters (21 feet) wide, and the clearance from the floor to the ceiling of the cargo hold is 4.4 meters (14.4 feet). The installed crane hoists may reduce overhead clearance to 3.51 meters (11.5 feet). The An-225 was adapted from the An-124 and significantly enlarged to serve as the carrier aircraft for the Soviet space shuttle, the Buran. 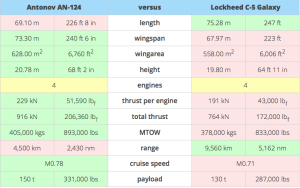 The relative sizes of the An-124 and An-225 are shown in the following diagram, with a more detailed comparison in the following table. 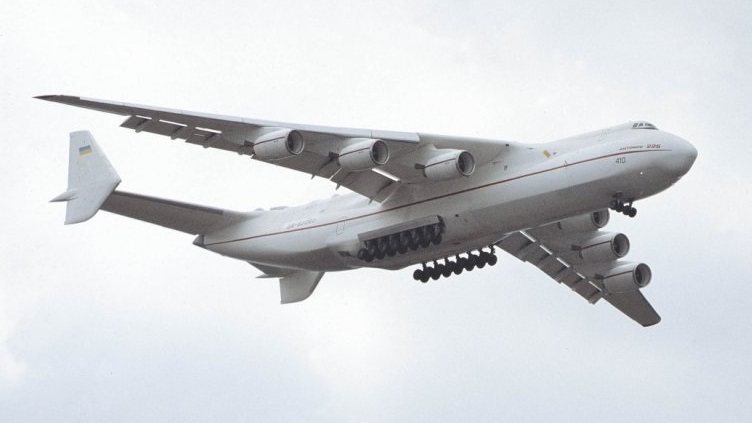 The only An-225 ever produced made its first flight in December 1988. 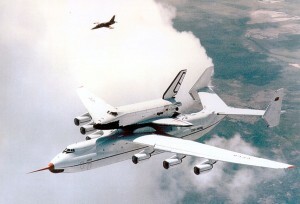 It is shown carrying the Buran space shuttle in the following photo. 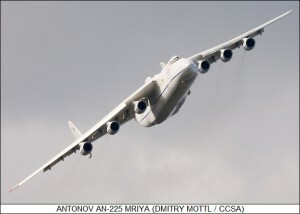 After the collapse of the Soviet Union in 1991 and the cancellation of the Buran space program, the An-225 was mothballed for eight years until Antonov Airlines reactivated the aircraft for use as a commercial heavy-lift transport. 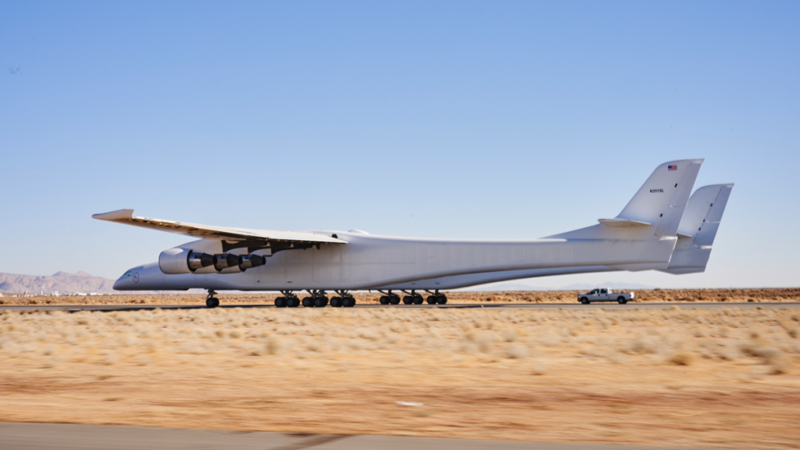 In this role, it can carry ultra-heavy / oversize cargo weighing up to 250 metric tons (551,000 pounds). 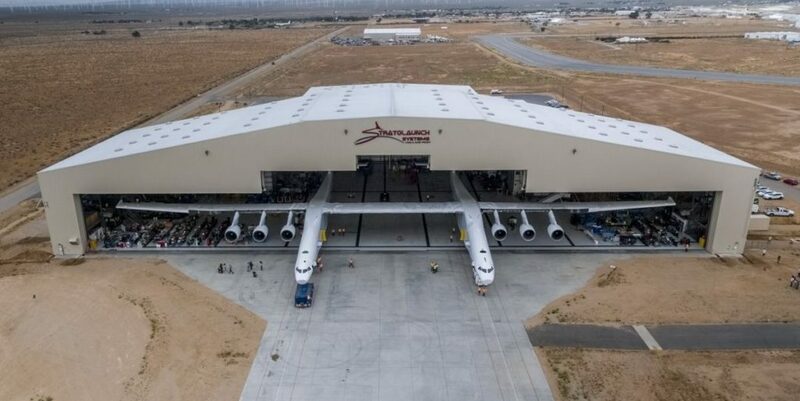 Surprisingly, it appears that the giant An-225 is about to enter series production. 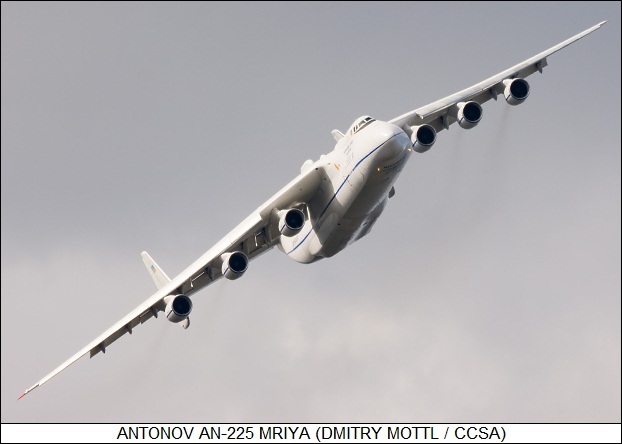 Antonov and Aerospace Industry Corporation of China (AICC) signed a deal on 30 August 2016 that will result in An-225 production in China. The first new An-225 could be produced in China as early as in 2019. When it enters service, this new version of the An-225 will modernize and greatly expand China’s military and civil airlift capabilities. While it isn’t clear how this airlift capability will be employed, it certainly will improve China ability to deliver heavy machinery, bulk material, and many personnel anywhere in the world, including any location in and around the South China Sea that has an adequate runway. This post was updated on 18 April 2019. 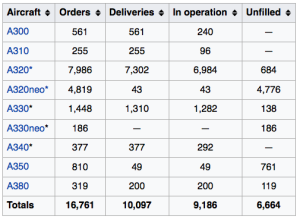 In spite of the significant interest, actual military, commercial and other customers have been slow coming to the marketplace with firm orders, the airship manufacturers have been slow in developing and delivering advanced airships that meet their customer’s needs, and funding was prematurely curtailed for several ambitious projects. 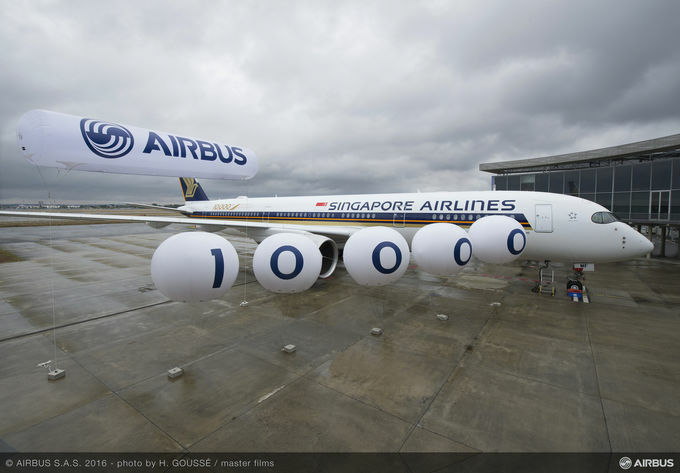 This uncertain business climate seems likely tochange by the early 2020s, when several different heavy-lift airships are expected to be certified by airworthiness authorities and ready for mass production and sale to interested customers. Some of the advanced airship concepts being developed, especially for future heavy cargo carriers, will result in extremely large air vehicles on a scale we haven’t seen since the heyday of the giant zeppelins in the 1930s. Consider the following hybrid airships shown to scale with contemporary fixed-wing cargo aircraft. 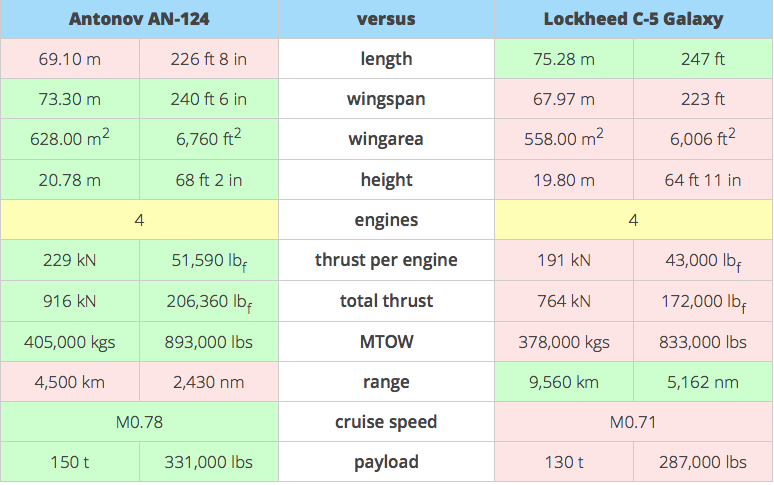 The following table presents a summary of some key physical characteristics of these advanced airships. The largest among this group of airships is the Airlander 50. As a point of reference, the gas envelope on the giant zeppelin Hindenburg was twice as large, at 200,000 cubic meters (7,062,000 cubic feet), but using hydrogen as the lift gas instead of helium as in the modern airships. Among the airships in the above list, the following have actually flown: Skybus 80K, Dragon Dream, HAV-304, Airlander 10 prototype, P-791 and the Zeppelin NT 07. 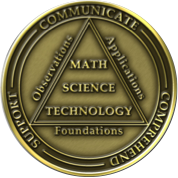 As of April 2019, the others in the list were under development or remain as concepts only. 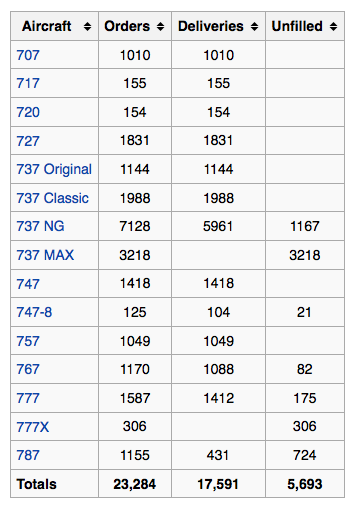 The Zeppelin NT 07 is the only advanced airship in this list that currently is flying regularly in commercial service. 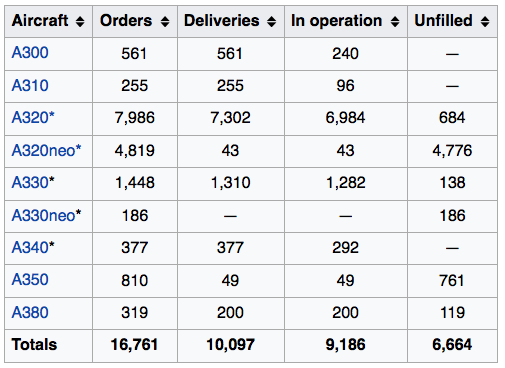 By the early 2020s, we likely will see several additional advanced airships on this list ready for sale to potential customers, the leading candidates being the ML866 / Aeroscraft Gen 2, Airlander 10 and LMH-1. Now, let’s take a look at the individual advanced airships in this group. The Skybus 80K was a proof-of-concept, non-rigid airship designed to carry a significant payload and fly autonomously on long duration missions. 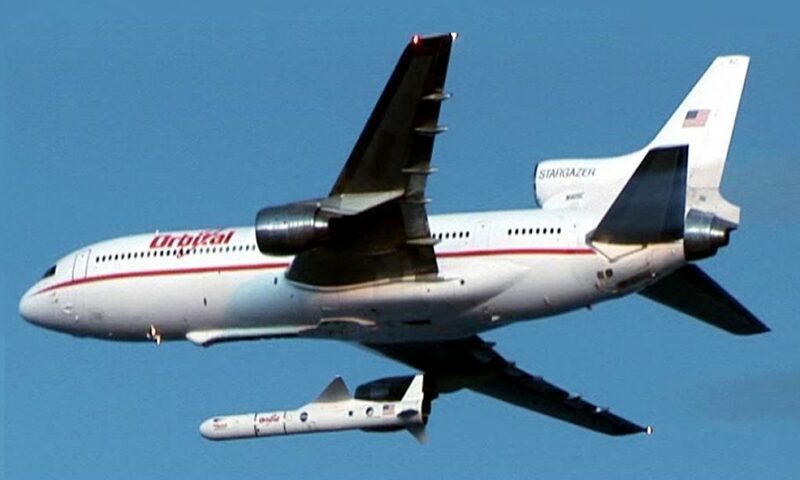 The goal of this program was to demonstrate greater persistence over target with a greater payload than was possible using an unmanned drone aircraft. 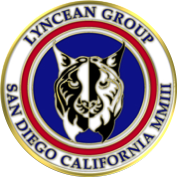 Lindstrand USA was responsible for the Skybus 80K vehicle primary envelope and flight structure, which is similar in design and operation to a non-rigid Goodyear blimp (the version before the Zeppelin NT model LZ N007-101). All of the lift is provided by helium and the propeller is used only for propulsion. In the Skybus 80K, the gas envelope is divided into a sealed main helium gas volume and separate gas volumes called “ballonets” that contain ambient air at atmospheric pressure. A simple airship like the Skybus 80K typically would be trimmed for neutral buoyancy. To takeoff, fans would be used to vent some air from the ballonets, slightly reducing their internal pressure and mass, and allowing the helium gas volume to expand, with the net result of increasing buoyant lift. As the airship gains altitude, external air pressure decreases, allowing the helium gas volume to expand within the gas envelope, into space previously occupied by the ballonets, which vent a portion of their air content overboard. The airship reaches its maximum altitude, known as its “pressure height,” when the helium gas volume has expanded to fill the gas envelope and the ballonets are empty. At this point, the airship’s mass is at a minimum, but the helium lifting gas can expand no further. To descend, a fan is used to inflate the ballonets with outside air, adding mass and slightly compressing the helium into a smaller volume. This action decreases buoyant lift. As the airship continues to descend into the denser atmosphere, the helium gas volume continues to compress and the ballonets become proportionately larger. Ballonet inflation is controlled to manage buoyancy as the airship approaches the ground for a landing. In flight, inflating only the fore or aft ballonet, and allowing the opposite ballonet to deflate, will make the bow or stern of the airship heavier and change the pitch of the airship. These operating principles are shown in the following diagrams of a blimp with two ballonets shown in blue. Flying out of Loring Air Force Base in Caribou, Maine, the Skybus 80K met its program objectives for carrying 500 pounds (227 kg) to 10,000 feet (3,048 m) for 24 hours without refueling. While these may seem to be modest objectives, Skybus 80K was granted the first U.S. certificate for an unmanned experimental airship. This was an important milestone in the development of optionally manned airships. 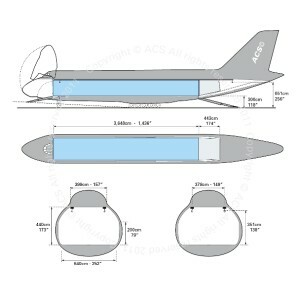 An SAIC concept for an full-scale optionally manned airship is shown in the following figure. The aeroshell defines the boundary of the helium envelope. 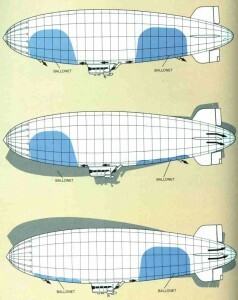 Within the aeroshell the COSH system manages airship buoyancy using the Helium Pressure Envelopes (HPE, the blue tanks in the following diagram) and Air Expansion Chambers (AEC, the grey bladders). To reduce buoyancy: The COSH system compresses helium from the aeroshell volume into the HPEs, which contain the compressed helium and control the helium pressure within the aeroshell. The compression of helium into the HPEs creates a negative pressure within the aeroshell, permitting the AECs to expand and fill with environmental air. The greater mass of the air within the aeroshell and the reduced helium lift make the Aeroscraft heavier when desired. To increase buoyancy:The COSH system releases pressurized helium from the HPEs into the aeroshell. This creates a positive pressure within the aeroshell, causing the AECs to compress and discharge air back to the environment. With reduced environmental ballast and greater helium lift, overall buoyancy of the Aeroscraft is increased when desired. Dragon Dream was first “float tested” on 3 January 2013 inside a former blimp hanger at the Marine Corps Air Station in Tustin, CA. The airship was rolled out of its hangar on 4 July 2013 and taxi tests were conducted. All work under Project Pelican was completed within budget in August 2013. The Pentagon declared that the tests of the Dragon Dream were a success, with the craft meeting its demonstration objectives. 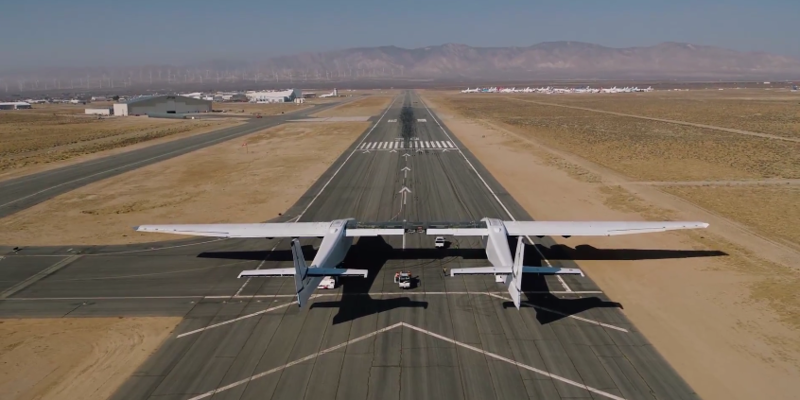 On 5 September, Aeros announced that the Federal Aviation Administration (FAA) had granted an R&D Airworthiness Certificate for Dragon Dream, permitting flight testing in designated controlled airspace. Dragon Dream and it made its first flight on 11 September 2013. The Dragon Dream airship was damaged in October 2013 when a partial roof collapse occurred while the airship was inside the blimp hanger. The airship was not repaired. 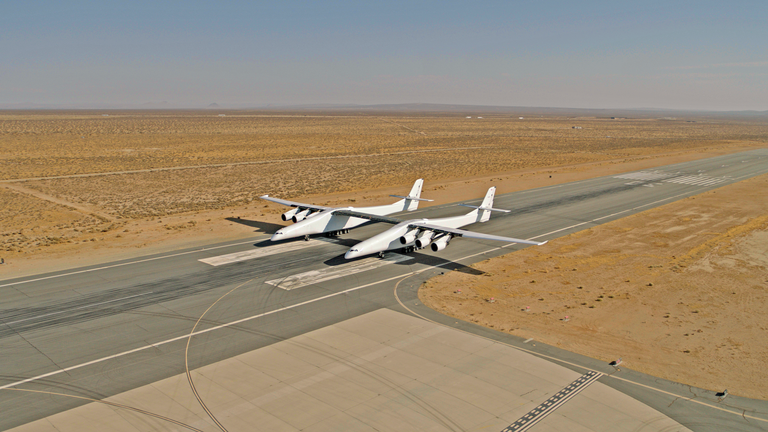 Aeros claims that the technologies demonstrated by the Dragon Dream will “enable the Aeroscraft to fly up to 6,000 nautical miles, while achieving true vertical takeoff and landing at maximum payload, to hover over unprepared surfaces, and to offload over-sized cargo directly at the point of need.” Operational Aeroscraft airships will be designed with an internal cargo bay and a cargo suspension deployment system that permits terrestrial or marine (shipboard) delivery of cargo from a hovering Aeroscraft, without the need for local infrastructure. 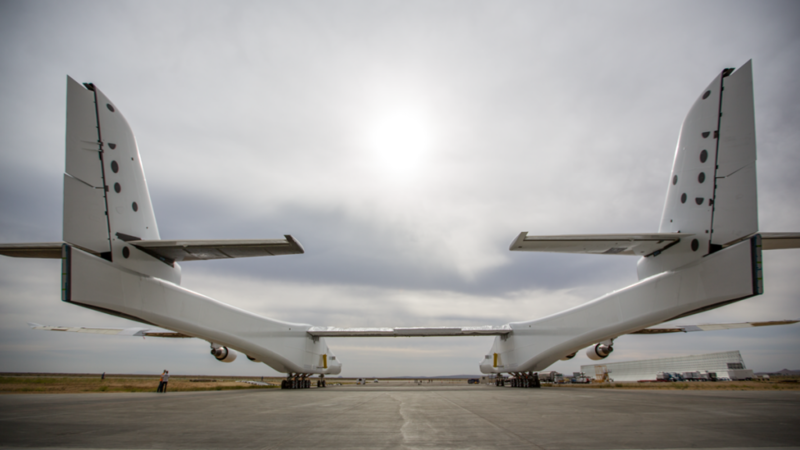 On 8 August 2018, Aeroscraft announced that “they have completed the preliminary design phase for their Aeroscraft Gen 2 Cargo Airship”……”Aeroscraft Gen 2 will have enhanced buoyancy control, flight surfaces and modular cargo systems. 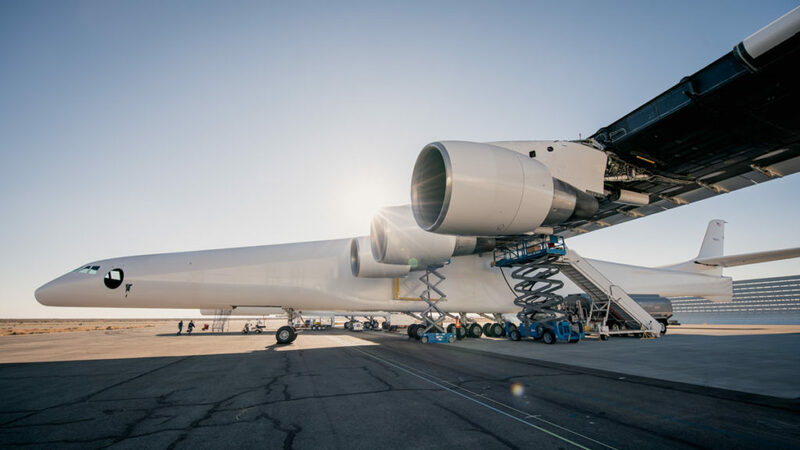 The aircraft will feature zero emission operations, representing the only truly green technology capable of moving cargo over long distances. 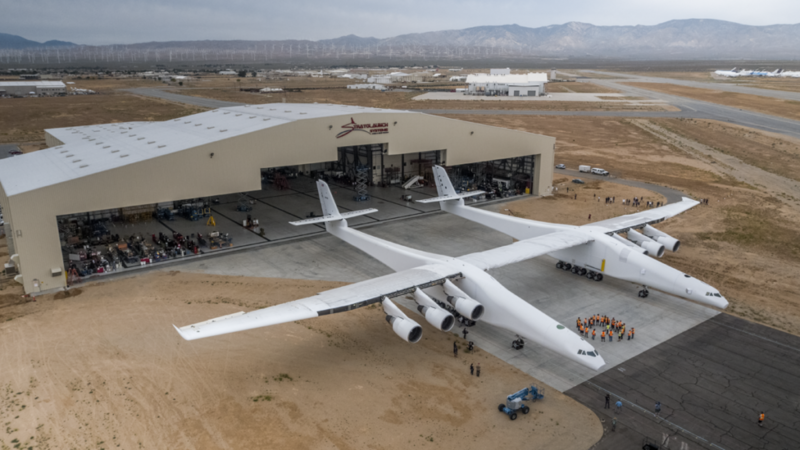 Aeros is now proceeding with the build and test phase on all major systems and subsystems for Aeroscraft Gen 2.” The Aeroscraft Gen 2 is being designed with great range (3,100 nautical miles; 5,741 km), a cruise speed of 100 – 120 knots, and an altitude ceiling of 12,000 feet (3,658 m). 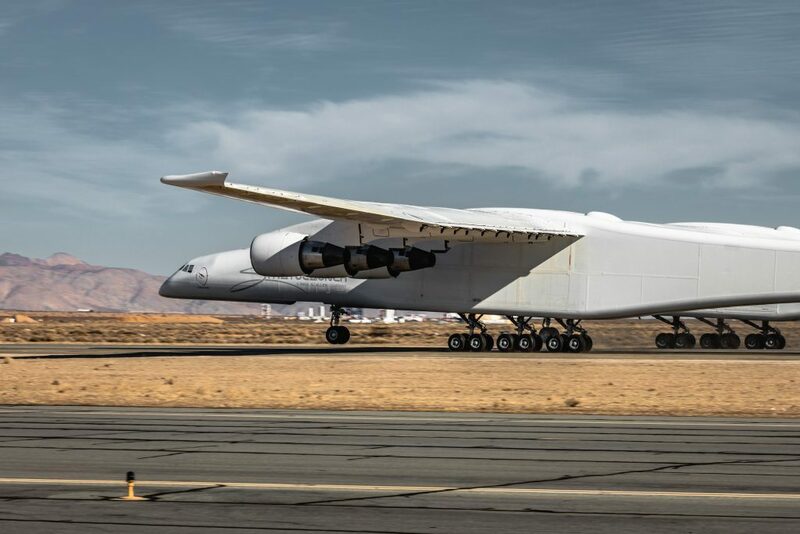 The basic Aeroscraft design can be scaled up to handle much heavier cargo. 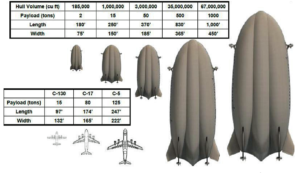 The approximate scaling of an Aeroscraft airship as a function of cargo weight is shown in the following graphic. In 2008, the firm built and flew the small, unmanned HAV-3 hybrid airship demonstrator. 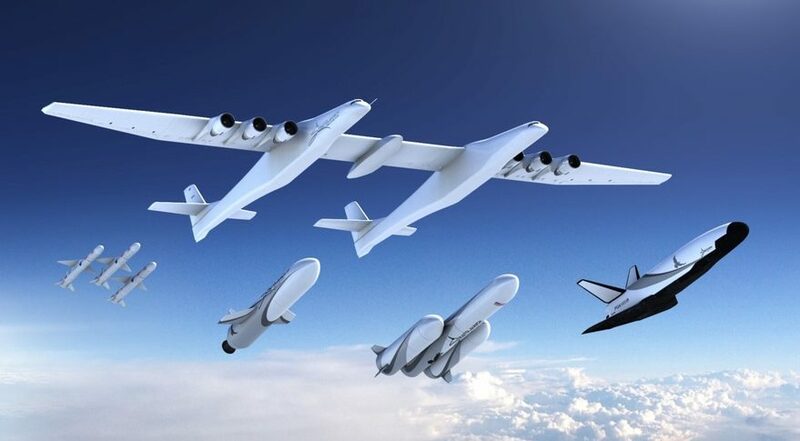 The 50 foot (15 meter) long HAV-3 flew from 2008 to 2010 and served to validate the design of the much larger HAV-304 that was proposed by the team of Northrop Grumman and HAV for the U.S. Army’s Long Endurance Multi-Intelligence Vehicle (LEMV) program. In 2010, the Northrop Grumman / HAV team was awarded the LEMV contract to deploy a large, optionally manned airship capable of flying surveillance missions of up to three weeks duration at 20,000 feet (6,100 m) in uncontested airspace in conflict zones; initially in Afghanistan. An illustration showing the HAV-304 configured for the LEMV mission is shown in the following diagram. As a hybrid airship, the HAV-304 generated only part of its lift from helium, nominally 60 – 80%. 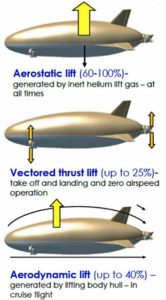 The balance of the lift is generated by vectored-thrust propellers and by aerodynamic lift from the shaped gas envelope, which acts as a lifting body when the airship has forward speed. The helium gas envelope is slightly pressurized to maintain its aerodynamic shape. For the LEMV mission, the airship would transit at a maximum speed of 80 knots, and loiter in its designated operating area at 30 knots. This hybrid airship is negatively buoyant and cannot hover or make a vertical takeoff or landing. The HAV-304 takes off and lands on inflatable skids and requires a takeoff run of less than 1,000 feet (305 m). Airship trim is controlled much like in a conventional blimp, using multiple ballonets located fore and aft in each of the hulls. Hybrid Air Vehicles bought the airship back from the Army in October 2013 for $301,000 and agreed to give the Army access to data from future civilian flights. After removing LEMV mission-related hardware, HAV returned the HAV-304 airship to the UK to continue developing this airship as the Airlander 10 prototype. A rigid structure running under the gas envelope supports the optionally-manned cockpit, flight control and mission systems, cargo and fuel. Weight from this rigid module is distributed across every frame of the airship via cables running across and into the hull as well as internal diaphragms. Maximum payload capacity is 22,050 pounds (10,000 kg), which must be suspended externally from a centerline payload beam. Maximum speed is 80 kts (148 kph), maximum altitude is 16,000 feet (4,880 m), and manned mission duration is up to 5 days. Unmanned missions can be significantly longer. Airlander 10 made its first two flights on 25 August 2016 from Cardington Airfield in Bedfordshire, UK. While the first flight went well, the second ended with an inauspicious soft crash landing with some damage to the airship, but no injuries to the crew. On 13 January 2019, the British Broadcasting Corporation (BBC) reported that HAV had retired the £32 million ($42 m USD) Airlander 10 prototype following successful final testing and achievement of key certification milestones with European civil aviation authorities. This report indicates that the all-weather capability of the Airlander 10, including anti-icing, would be tested in the second half of the test program. 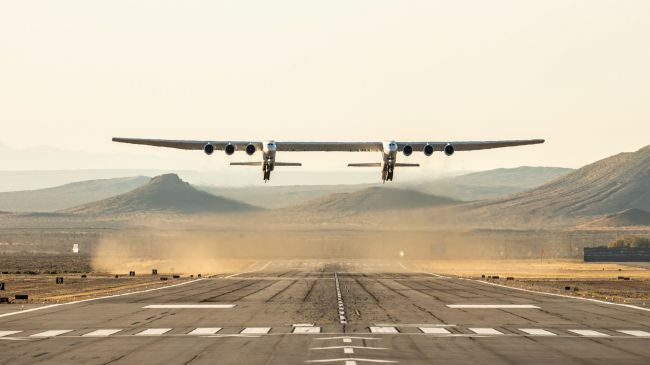 The report also suggests that the commercial Airlander 10 may have an enhanced thrust vectoring system that enables a (limited) VTOL capability. A larger version known as Airlander 50 also is being designed with internal cargo bays capable of carrying up to 132,300 pound (60,000 kg) payloads. A concept drawing for Airlander 50 is shown below. The Lockheed Martin P-791 was one of the competitors in the U.S. Army’s LEMV program, which was won by the Northrop Grumman / HAV team with the HAV-304 hybrid airship. Like the HAV-304, the P-791 tri-lobe hybrid airship flies under the combined influence of thebuoyant lift from helium, vectored thrust from propellers during takeoff and landing, and aerodynamic lift from the shaped gas envelope when the airship is in forward flight. The gas envelope is slightlypressurized to maintain its aerodynamic shape. The P-791 is not designed for vertical takeoff and landing or hover, since it depends on some aerodynamic lift being generated by the hull. When the P-791 is on the ground, it is heavier-than-air. To move the airship on the ground, its air cushion landing system (ACLS) operates in lift mode. The four air cushion pads on the bottom of the airship allow it to float on cushions of air and use the propulsion system to move the airship over almost any type of surface (pavement, unimproved natural surface like dirt, sand, snow or ice or water). 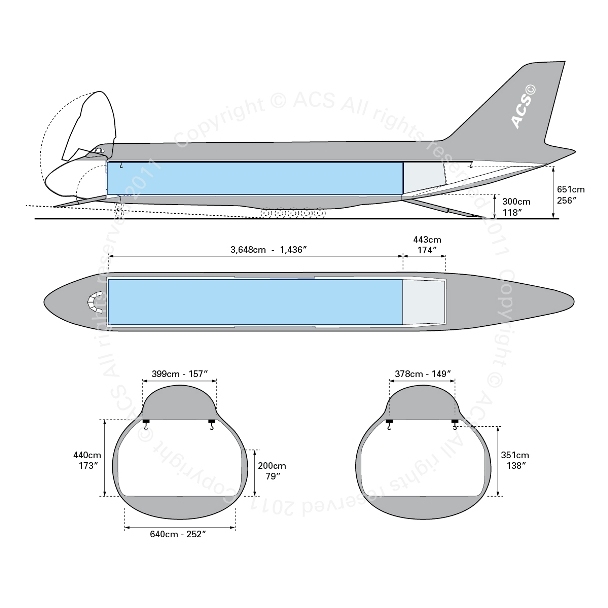 The ACLS fans can be reversed and operated in suction mode, which enables the airship to “grip” a solid surface and remain stationary during ground cargo handling without the need for ground-based mooring / docking hardware. In March 2011, Lockheed Martin announced that it planned to develop a larger commercial version of the P-971, to be called SkyTug, which would be scaled up to carry at least 20 tons of cargo for the Canadian firm Aviation Capital Enterprises of Calgary. The first commercial airship was expected to be delivered in 2012, and future versions were expected to have larger cargo carrying capacity. According to Aviation Capital, “the fully vertical-takeoff-and-landing (VTOL) capable SkyTug will provide ‘greater payload and range at a fraction of the cost of a helicopter’. The larger ships that will follow apparently won’t be fully VTOL – they’ll require something of a run-up on the ground to generate dynamic lift and get airborne, rather as an airplane does.” Evidently, the VTOL version was to have powerful turboshaft engines to provide the needed lift, while the larger versions would have been more conventional hybrid airships. By 2015, reference to SkyTug seems to have disappeared and Lockheed Martin was promoting the LMH-1 as their next large commercial hybrid airship based on the P-791 design. As it currently is described by Lockheed Martin, the LMH-1 is designed to carry a crew of 2, up to 19 passengers or 21 tonnes (21,000 kg / 46,300 lb) of cargo at a maximum speed of 60 kts (111 kph) over a range of 2,593 km (1,400 nautical miles). The 18 m x 3.2 m x 3 m (59 ft x 10.5 ft x 9.8 ft) cargo compartment is a little bigger than the cargo box of the widely used Lockheed Martin C-130 Hercules fixed-wing cargo aircraft. The LMH-1 design can be scaled up to carry much heavier cargo. In November 2015, the U.S. Federal Aviation Administration (FAA) approved Lockheed’s certification plan for the LMH-1. Lockheed Martin also is working with Transport Canada on plans to a get the airship certified for use in Canada. Lockheed Martin has engaged the sales firm Hybrid Enterprises to market the LMH-1. In September 2017, Lockheed Martin claimed it had Letters of Intent for 24 LMH-1 airships. First flight of the production airship is expected in 2019. Small, unmanned air vehicles (UAV), now commonly called unmanned air systems (UAS), can carry advanced sensors and weapons, but generally have short range. In spite of their range limitations, UASs can provide valuable and cost-effective capabilities for military planners and war fighters. At a recent conference is Washington D.C., DARPA Deputy Director Steve Walker asked the following question: “With the ranges we are looking at in the Pacific Theater, how do we get our small UAS to the fight?” Actually, he already knew the answer. SAIC and ArcZeon International, LLC proposed a UAS carrier airship for this type of mission. A concept drawing for such an airship is shown below. No contract was awarded for development of this airship concept. While Dassault Systemes is not in the business of building airships, they have developed an integrated system called the 3DExperience platform to assist clients in developing “compelling consumer experiences.” I hope one of their clients likes the idea of a flying cruise liner. Let’s take a closer look at the airship. The closest you can come to an airship cruise today is a short commercial flight aboard a 12 – 14 passenger Zeppelin NT 07 airship, which is very similar in design to the new Goodyear airships. Friedrichshafen, Germany, home of the original Zeppelin factory, is the home base for Zeppelin NT. The Zeppelin NT is longer than a Boeing 747-400 airliner. The airship’s primary structure weighs only about 1,000 kg (2,200 lbs) and the empty weight of a Zeppelin NT is about 6,622 kg (5,181 lb). In comparison, the empty weight of a Boeing 747-400 is 184,567 kg (406,900 lb). In normal operation, the Zeppelin NT operates with a slight negative buoyancy (i.e., the gas cells do not create enough buoyancy to make the Zeppelin NT lighter-than-air). At takeoff and landing, negative buoyancy is overcome with the application of engine power to three propellers (two flank, one stern) that have been vectored to generate the needed lift and some forward momentum. As forward speed increases, some aerodynamic lift is generated by the aeroshell and the propellers are rotated to deliver only propulsive thrust. My wife and I took a flight on the Zeppelin NT in early June 2017, on a clear blue sky day, one day after a modest wind and rain storm had passed through the Friedrickshafen area and temporarily grounded zeppelin flight operations. Clearly, weather is much more of an issue for flying zeppelins than it is for winged heavier-than-air craft. Nonetheless, in suitable weather conditions, flight in a zeppelin is a remarkable experience. Our short tourist flight in the Zeppelin NT was hardly an adequate basis for a zeppelin commercial business model. However, based on this flight, it’s much easier for me to visualize the utility of a large commercial airship for delivering cargo, passengers and emergency services to remote areas that are harder to reach with other modes of transportation. How Long Does it Take to Certify a Commercial Airliner? 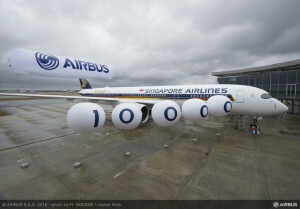 After designing, developing, and manufacturing a new commercial airliner, I’m sure the airframe manufacturer has a big celebration on the occasion of the first flight. The ensuing flight test and ground static test programs are intended to validate the design, operating envelope, and maintenance practices and satisfy these and other requirements of the national certifying body, which in the U.S. is the Federal Aviation Administration (FAA). Meanwhile, airlines that have ordered the new aircraft are planning for its timely delivery and introduction into scheduled revenue service. The time between first flight and first delivery of a new commercial airliner is not a set period of time. 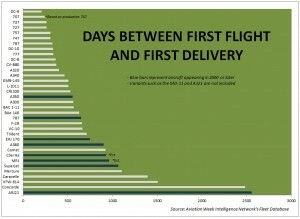 As you can see in the following chart, which was prepared by Brian Bostick (http://aviationweek.com/thingswithwings), there is great variability in the time it takes to get an airliner certified and delivered. In this chart, the Douglas DC-9 has the record for the shortest certification period (205 days) with certification in November 1965. The technologically advanced supersonic Concorde had one of the longest certification periods (almost 2,500 days), with authorization in February 1976 to conduct a 16-month demonstration period with flights between Europe and the U.S. before starting regular commercial service. The record for the longest certification period goes to the Chinese Comac ARJ21 twin-jet airliner, which is the first indigenous airliner produced in China. The first ARJ21 was delivered to a Chinese airline in November 2015. The ARJ is based on the DC-9 and reuses tooling provided by McDonnell Douglas for the licensed production of the MD-80 (a DC-9 variant) in China. I suspect that the very long certification period is a measure of the difficulty in establishing the complete aeronautical infrastructure needed to deliver an indigenous commercial airliner with an indigenous jet engine. Time is money, so there is tremendous economic value in minimizing the time between first flight and first delivery. 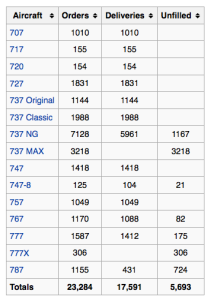 The first 16 aircraft at the top of the chart all enjoyed relatively short certification periods. This group, which includes many aircraft that appeared in the 1960s – 70, averaged about 400 days between first flight and first delivery. 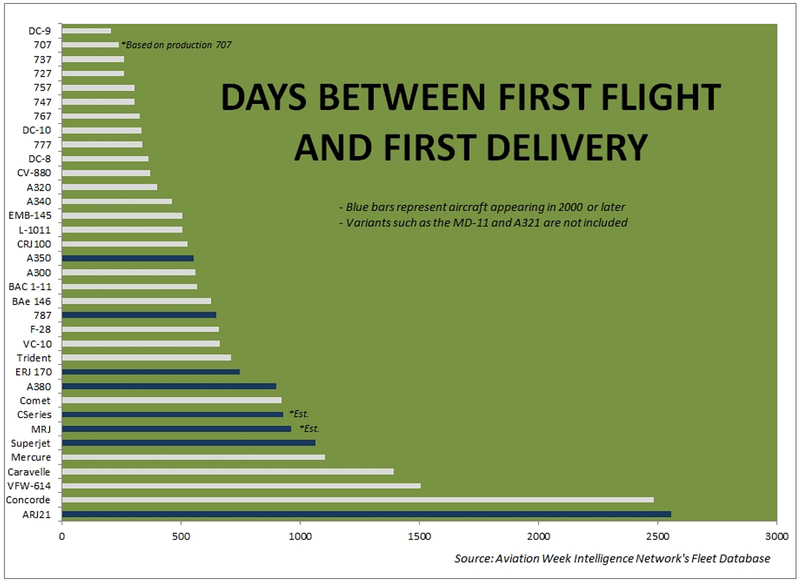 More modern aircraft (blue bars in the chart representing aircraft appearing in 2000 or later) have been averaging about 800 days between first flight and first delivery (excluding ARJ21).